Happy Wednesday, everyone!! Welcome to this month's Taylored Expression "Blast from the Past" blog hop!! This month's theme is clean and simple...and I decided to use one of my tried and true themes/designs for it....rainbows!! I often use a similar design concept when bringing the rainbow theme into a card, and it just happens to really work well. Here is what I created! Instructions: Fold white cardstock in half to make card base, and round the bottom corners. 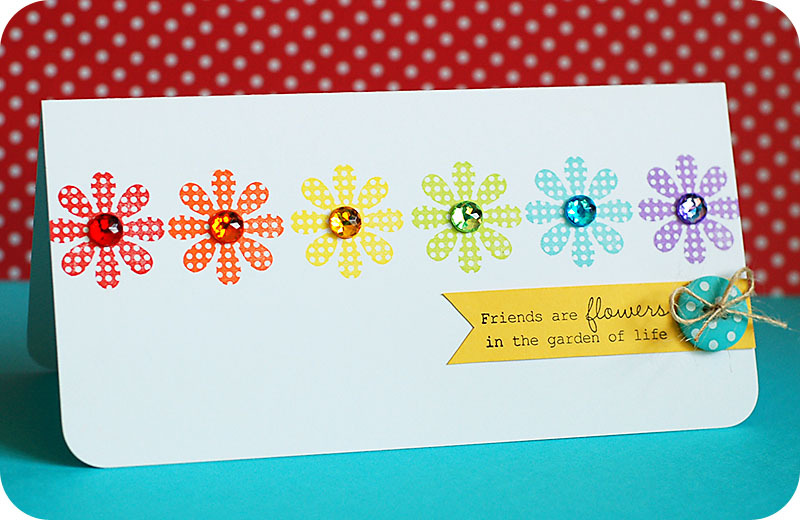 Stamp the flowers in a rainbow pattern across the top of the card, and accent the middles with a matching colored jewel. Stamp the sentiment to a yellow cardstock strip, and cut a flag shaped end. Adhere the sentiment strip to the right side of the card. Tie a twine bow through a button, and then adhere to the sentiment strip to finish. Speaking of rainbow cards, if you frequent my blog at all....you might know that I created a fun rainbow themed card using twine for the Lawn Fawn release of "Smitty's ABCs". Well, that card got a bit of recognition, and I wanted to share that with you. First off...it was a daily feature in the 2Peas gallery on the day it was posted, and then Kristina also included it in the April 12th Newsletter!! There also happened to be a twine challenge at Wee Memories that same week, and I entered the card in for it. Well, I was picked as the "Top Hoot" and won a prize package from The Twinery!! Yay!! 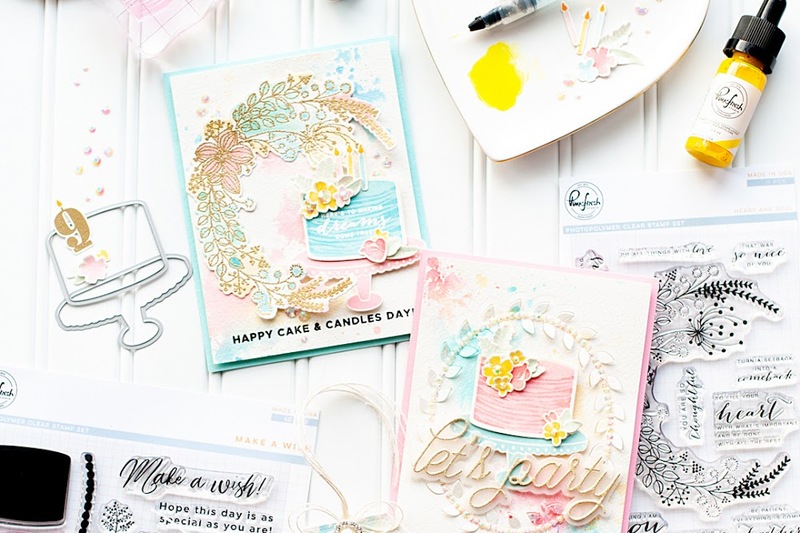 Who knew one little card would be so popular...you just never know what people are going to love! Want to join in next month? Wow! This is fabulous! I absolutely love your flower rainbow!!! Simple but bold, I love it! Lea I absolutely L*O*V*E this!!!!!Cute! Cute! Cute! LOVE this CAS card Lea! The rainbow flowers are fabulous! 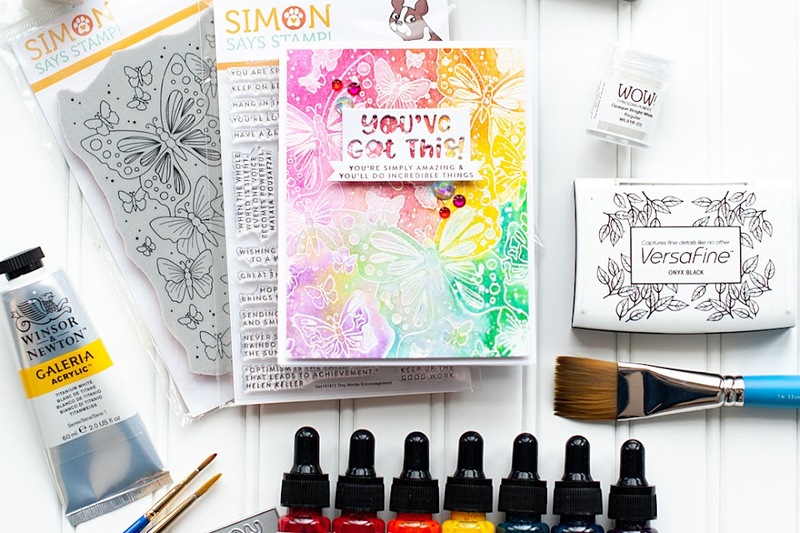 I love anything with rainbow colors, and this card is simply DELIGHTFUL!!! SO beautiful Lea! LOVE the rainbow look...I am SO totally going to try that!! Love the rainbow of colors Lea. So clean and simple - what amazing work! This is just perfect. Thanks so much for sharing! Wow! This is fantastic! I LOVE everything about it! This is seriously THE BOMB! (do people even say that anymore??) I love it!!!!!! What a wonderful row of colorful flowers Lea! Lea this is so pretty and so CAS! How did you get the row of flowers stamped so straight? CAS perfection here! SOOOO simple! That is amazing! Love it and that quote it TRUE!!!!! Great card. Congrats on winning the challenge. Wonderful idea!! You are so creative, love the inspiration. Your card is adorable! WOW!! This is such a fabulous CAS design...the rainbow of flowers is absolutely gorgeous!!! and again... I love it !!!!! WOWZA! This is AWESOME. Seriously, I love it. SO CLEAN and bright and happy. Really, thanks for sharing this. Saw this on the newsletter... So cute! Lea--this card is amazing! Love the rainbow, the polka dots, and the jewels! What a great card! 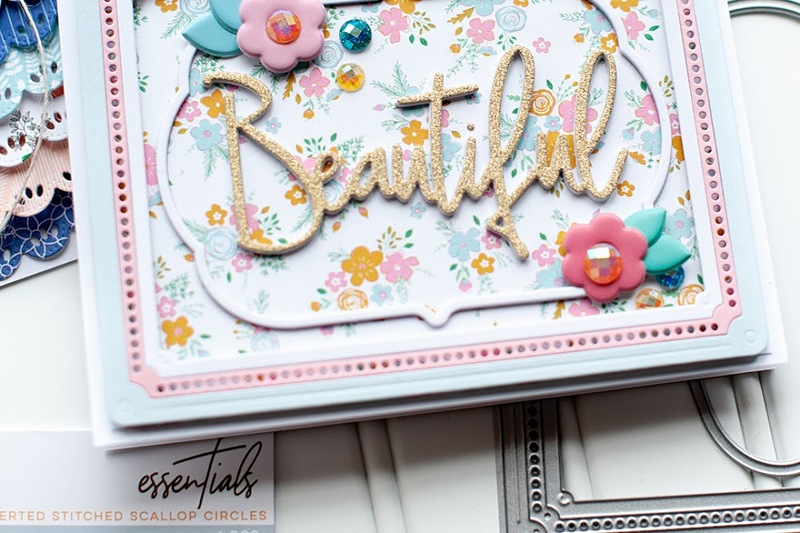 What a beautiful and cheerful card! Love it!